Dating from the late 19th century and part of the once-famous and now altered station complex at Crianlarich this impressive classical brick 13-bay engine shed survives largely intact. 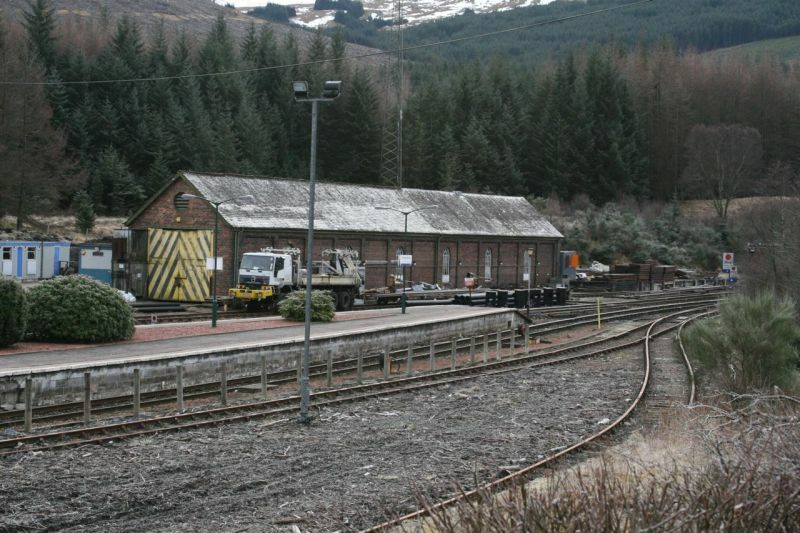 Retaining its distinct architectural character the engine shed forms an important part of Crianlarich's railway history and is a strong example of the wider West Highland line architecture and its place in shaping the Highlands. The predominantly mirrored West and East elevations have alternating blank and glazed bays with round-arched windows which are divided by pilasters. There is a corbelled eaves course. Both the North and South gabled elevations have oculi windows at the apex; the South elevation has a small replacement door. The principal entrance is to the North where there is a large square opening with a modern 2-leaf door. An open timber roof supports a simple, functional interior. Central railway track flanks lower maintenance deck reached by steps. Part timber, part earth floor. Red brick. Grey slate pitched roof. Fixed light round-headed windows with some original glazing.